The old man was as greedy with his bottle as he was lazy with his seniority. Still, he was company. And such stories! Geoffrey felt his face grow hot. He was about to add something about glory, but didn’t. The old man snorted and reached a hand for Geoffrey’s bottle. Some people get jealous of other’s success and take on an air of superiority to try and mask it. I like this. Okay, American here, not entirely sure whether this is the tale of a time traveler or a drunk man making impossible claims about seeing the Globe in the days of Lord Oliver–who, by the way, does not easily come up in a Google search, so maybe I’m entirely off base about the above. Laurence Olivier first played Hamlet with the Old Vic company in 1937, when he was in his thirties. He was compared unfavorably to John Gielgud. He may have played the Dane earlier, but there’s no record of it I can find. The drunk old stagehand is obviously bullshitting, since the restored Globe shown in the photograph was built in 1997, eight years after Olivier’s death. Geoffrey is a bit wide-eyed himself, I think. “Olivier” not “Oliver” (*Embarrassed Facepalm*). Thank you for not smirking out loud. 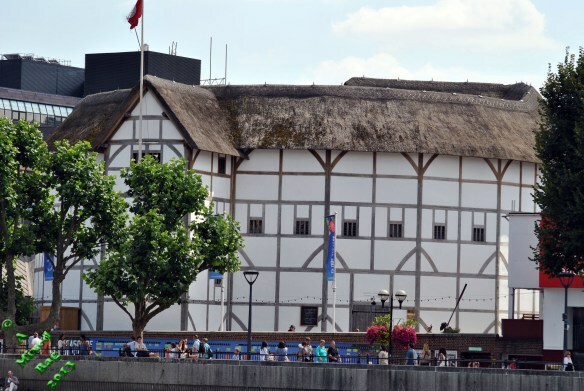 I’ve seen a play or two at the globe – with a bottle in my hand – and I would love to have seen Old Larry overacting there!